I never ever fill it to capacity! 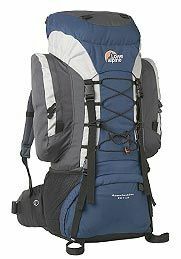 I bought my pack in October, 2004 at the Kittery Trading Post in Maine just prior to my second road trip ever (we had returned from my first just one month before). It is on the heavy side and a lot larger than I would like, but it's my first pack and has some sentimental value. When checked, this piece of luggage has caused more headaches than any other piece of luggage I've owned. It must get stuck in the conveyor belt or something, because this bag has been lost 2 out of every 3 times I've checked it. This is really the main reason I began carrying it on, I decided to "one bag" before I knew it was a thing (also here and here). Also, it's really big, made of a heavy material, and the side pockets are bulky. A trip to Philadelphia in 2005 where I was locked out of the hostel until evening is the cause of my minimalistic tendencies. I carried 55+ liters of junk around with me in a snow storm all day! I vowed to never be in that situation again. above, but doesn't look it! Though I am now a minimalist packer and would prefer a smaller (and lighter) pack, I can't justify it at the moment because the space in my pack that I don't fill rolls into itself and makes the bag seem much smaller than it actually is. The extra space actually gives me peace of mind that I will have room for everything I collect during my trips. On a recent trip to England I was able to bring home a box set of all seven Harry Potter books and still have my bag small enough to be stuffed in one of those carry-on testers at the ticket desk (I was pretty proud of this). For that recent trip to England, I filled a double sided packing cube with my clothes. With the exception of a pair of capris and a hooded sweatshirt I was able to get all of my clothes into one. 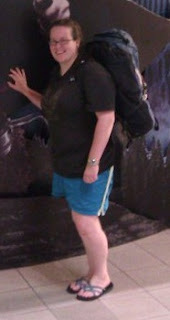 I easily had enough clothes for 6 days (re-wearing shorts & capris a few times each). I was able to wash my clothes at St. Paul's HI Hostel in London on day 6 of a 10 day trip. All my clothes (and flip flops) were stuffed in the sleeping bag compartment at the bottom of the bag. I was on the trip with my mother and we shared toiletries that I held in one of the side pockets. I put my hair towel, packtowl, sarong, and sleep sack (which I never used) in the other side pocket. I kept maps in the top pocket. That's all. I had the entire inside of the bag above the sleeping bag compartment to fill with souvenirs and brochures for scrap-booking.